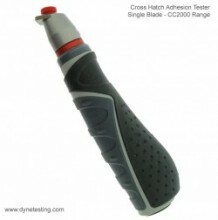 The Cross Hatch Adhesion Test is used to test the adhesion of dry coats of paint on their substrate by means of a series of cuts through the coating. Two series of parallel cuts cross angled to each other to obtain a pattern of 25 or 100 similar squares. 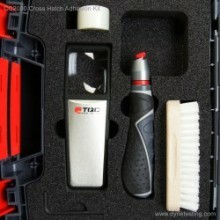 The ruled area is evaluated by using a table chart after a short treatment with a stiff brush, or adhesive tape for hard substrates. 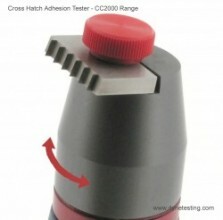 The cutting knife of this Cross Hatch Adhesion Test Cutter is easy to exchange without the use of extra tools and having a self positioning knife bracket ensures equal pressure on the cutting knife.